This article was first published in The Spectator on January 29 2011. Peter Howson started hallucinating last summer. Lying awake at night, he saw what he describes as ‘devils, demons and goblins’. They told him there was no point in living; that he might as well do away with himself. It was, he says, probably the worst year of his life. He felt as if he had been abandoned by God. At times he says he couldn’t really walk or see. He made himself feel better by reading the Book of Job — in which Job’s children die, his possessions are destroyed and his skin covered in boils as part of a test by God. I am anxious about meeting him in such a delicate state. On the phone he says he is getting better, but is ‘not out of the woods yet’. When I arrive at his home in Garnock Valley, west of Glasgow, a tiny dog called Tamsin yaps at the door. A sign reads: ‘Mad Hoose’. Howson is in combat trousers and a long-sleeved T-shirt. He has a studenty, unassuming manner, totally different from the glower he puts on for photographers. He makes tea and says sorry for the faint smell of cigarettes. As an artist Howson has never had to toil in obscurity. He became famous in his 20s as one of the New Glasgow Boys. His work — dramatic, menacing, grotesque — attracted a celebrity crowd (Madonna and Bowie were fans). In the 1990s he worked as official war artist in Bosnia. He also has Asperger’s syndrome, a mild form of autism which affects social interaction, and at the start of the interview he stares woodenly at the carpet. The deal had been brokered by Art & Soul Glasgow, with whom Howson fell out badly in 2009. It’s hard to find out any more: he doesn’t really want to talk about it. ‘I was naive,’ he says. The episode led to him handing over his financial affairs to a legal guardian — with Asperger’s, he was deemed unable to make business decisions on his own. The Ogilvie painting had been commissioned a year before, in 2008. Mario Conti, the Catholic Archbishop of Glasgow, wanted it as the centrepiece in a massive cathedral restoration. 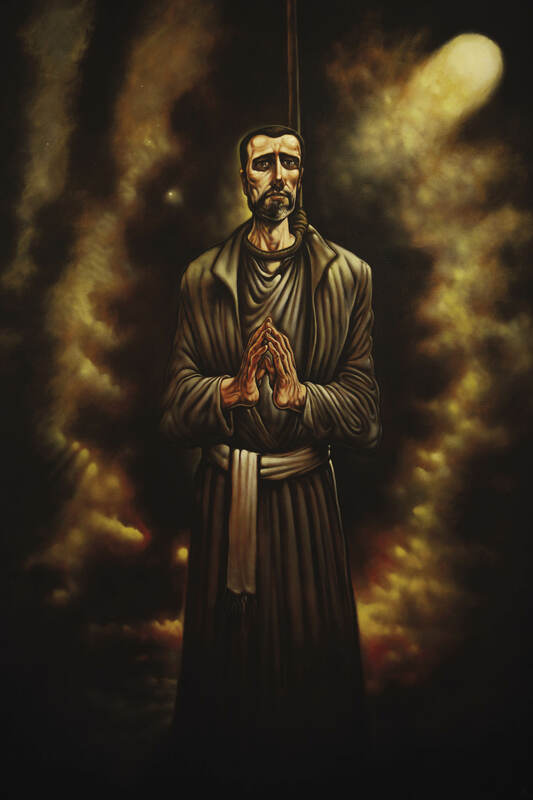 He chose the subject: in 1615 John Ogilvie was executed for being a priest just 800 yards from where the cathedral stands today. He is also Scotland’s only post-medieval saint. His working life sounds like therapy: as he paints he listens to Bach, or to audiobooks of Dante’s ‘Divine Comedy’ or Bunyan’s ‘Pilgrim’s Progress’.